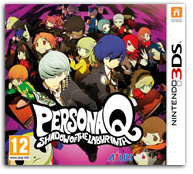 Persona®Q: Shadow of the Labyrinth | NIS America, Inc.
Persona Q takes the beloved characters from the hit role-playing games Persona 3and Persona 4, and puts them into an all-new adventure. The game combines the cast of characters from the Personagames and puts them in the gameplay style of EtrianOdyssey, where teams of five will navigate dungeons in a first-person view. Each character will also have access to their Persona, a manifestation of their strength of heart. Players will level up their Personas as well as collect, fuse, level up, and equip new Sub Personas. New characters, enemies, and the map-obstructing FOEs will give players all-new challenges. ©ATLUS ©SEGA. All rights reserved. Licensed to and published by NIS America, Inc. Developed by ATLUS. Persona is a registered trademark of Atlus U.S.A., Inc.